The Battery-Box HV is the first real high voltage battery that comes with a fexible and modular design with no cables inside. One Battery-Box HV contains 5 to 9 battery modules B-Plus H 1.28 in series connection and reaches up to 11.52 kWh usable capacity. The parallel connection of up to 5 identical BatteryBox HV allows a maximum capacity of 57.6 kWh. B-Box is designed with LiFePO4 chemistry battery which has been widely recognized as one of the safest battery technologies. LiFePO4 chemistry features stable structures and its thermal runaway temperature is over 480°C. That’s 100% higher than NCM and NCA chemistry. It is designed for residential and commercial applications with absolute safety. 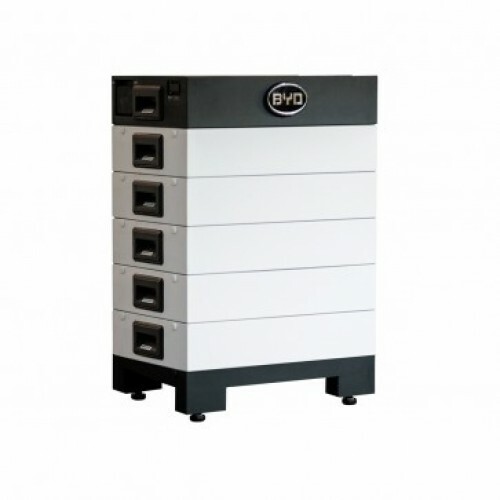 As the world's largest Electric Vehicle manufacturer, BYD brings railway and automotive battery standards to residential and commercial solutions: B-Box. 6+ years’ track records of large scale applications in Electric Vehicles ensure its safety and reliability. All products have been certified according to international standards including TUV, UL and CE. 10 Years Warranty provides the best guarantee of operation.